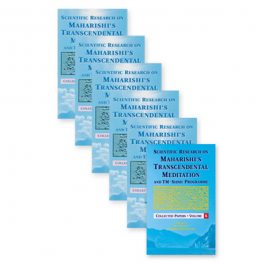 A series of reference volumes reprinting original research studies These six volumes collect the major scientific research studies on the Transcendental Meditation and TM-Sidhi program from the first published study in 1970 to 1996. Scientific Research on the Transcendental Meditation Program: Collected Papers, Volume 1. Edited by D. W. Orme-Johnson and J. T. Farrow. Rheinwewiler, Germany: MERU Press, 1977. (Papers 1–104) ISBN (updated): 9783883330013; Softcover, 728 pages • Volume 1 contains 104 papers—53 papers on Physiology, 25 papers on Psychology, 20 papers on Sociology, 3 Theoretical Papers, and 3 papers on the TM-Sidhi program. Scientific Research on Maharishi’s Transcendental Meditation and TM-Sidhi Programme: Collected Papers, Volume 2. Edited by R. A. Chalmers, G. Clements, H. Schenkluhn, and M. Weinless. Vlodrop, The Netherlands: MVU Press, 1989. (Papers 105–189) ISBN (updated): 9789071750038; Softcover, 700 pages • Volume 2 contains 85 papers—27 papers on Physiology, 25 papers on Psychology, 10 papers on Sociology, and 23 Review Papers. Scientific Research on Maharishi’s Transcendental Meditation and TM-Sidhi Programme: Collected Papers, Volume 3. Edited by R. A. Chalmers, G. Clements, H. Schenkluhn, and M. Weinless. Vlodrop, The Netherlands: MVU Press, 1989. (Papers 190–290) ISBN (updated): 9789071750045; Softcover, 788 pages • Volume 3 contains 101 papers—70 papers on Physiology, 16 papers on Psychology, 13 papers on Sociology, and 2 Review Papers. Scientific Research on Maharishi’s Transcendental Meditation and TM-Sidhi Programme: Collected Papers, Volume 4. Edited by R. A. Chalmers, G. Clements, H. Schenkluhn, and M. Weinless. Vlodrop, The Netherlands: MVU Press, 1989. (Papers 291–355) ISBN (updated): 9789071750052; Softcover, 744 pages • Volume 4 contains 65 papers—12 papers on Physiology, 10 papers on Psychology, 25 papers on Sociology, and 18 Review Papers. Scientific Research on Maharishi’s Transcendental Meditation and TM-Sidhi Program: Collected Papers, Volume 5. Edited by R. K. Wallace, D. W. Orme-Johnson, and M. C. Dillbeck. Fairfield, Iowa, USA: MIU Press, 1990. (Papers 356–430) ISBN (updated): 9780923569075; Softcover, 772 pages • Volume 5 contains 75 papers—25 papers on Physiology, 17 papers on Psychology, 14 papers on Sociology, and 19 Theoretical and Review Papers. 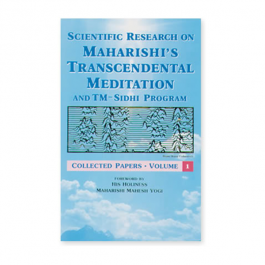 Scientific Research on Maharishi’s Transcendental Meditation and TM-Sidhi Programme: Collected Papers, Volume 6. Edited by M. C. Dillbeck. Vlodrop, The Netherlands, MVU Press, 2011. (Papers 431–524) ISBN: 9789080600522; Softcover, 1050 pages • Volume 6 contains 94 papers—40 papers on Physiology, 10 papers on Psychology, 18 papers on Sociology, and 26 Theoretical and Review Papers. Softcovers, Published 1970 to 1996.